One of the biggest dangers for the elderly and disabled while taking a shower is that of scalding water. When people aren’t in full control of their faculties or their bodies, it becomes easy for them not to realize that they are using water that is too hot to be safe, until it’s too late, leading to burns and other painful conditions. Here are some helpful tips on hot water safety for caretakers and family members of elderly and disabled people who need help bathing. How Serious Is Hot Water Damage? Hot water can cause serious damage, and should be taken very seriously as a threat to health and safety. Even in a highly supervised environment, accidental hot water exposure was able to cause serious damage to this elderly patient, causing injuries that would never fully heal. People have different preferences for the temperature of their bath or shower water. Some people like it lukewarm; others prefer it steaming hot. While extremely hot water does present some danger, that shouldn’t stop anyone who prefers hotter temperatures from being able to enjoy their shower or bath the way they like it, as long as exposure to high temperatures doesn’t affect any medical conditions they might have. One way to avoid many of the dangers with hot water is to lower the water heater’s thermostat to a safe level, which will keep the water that comes out of a faucet or shower head from reaching dangerous temperatures. Ideally, hot water should be within a few degrees of normal body temperature (about 97 or 98 degrees). When hot water comes out of the faucet, it will often be hotter than this, but will eventually cool through exposure to the air. Water becomes scalding (able to cause burns) around 140 degrees Fahrenheit (60 degrees Celsius); at this temperature it is able to cause serious damage to skin, muscle, and (if exposure is prolonged), even bone in a relatively short amount of time. 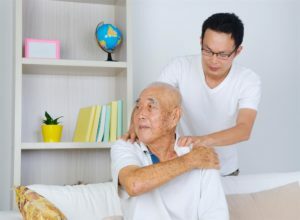 Even with safety measures in place, it’s important that a loved one be there to monitor an elderly or disabled person’s bathing to make sure nothing goes wrong. This doesn’t have to mean you sit in the bathroom with them while they do their business; what it does mean is that it’s important to check water temperature before they enter, pay attention to how long they are in the bathroom, and listen for any noises that might indicate trouble. American Bath Enterprises, Inc. specializes in shower stalls and bathtub enclosures for the elderly and disabled. To learn more, call us today at 888-228-4925.